A game for the Rambo in all of us. 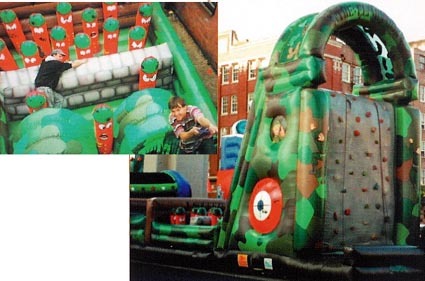 This 50 foot long inflatable will have you climb 20 feet high on a sheer rock face, scurry down the crazy netting, dive under tunnels, jump over bridges, squeeze through the inflated logs and wham the wall - all the time competing head-to-head against an opponent. Smiles and exhaustion guaranteed.